As we explained in Parking at Dub one of the main strengths of parking site is not just havig visitors but having them return to your domain. And along with many other features available, Dub uses newsletters as a key stretegy to have your users return back to your site. Newsletters work as follows. A user will visit your domain and if he finds it interesting he can sign up for a regular newsletter. Newsletters are sent either daily, weekly, fortnightly and monthly. When they sign up, they will have to confirm their email address. This is to ensure that we have a valid email address. 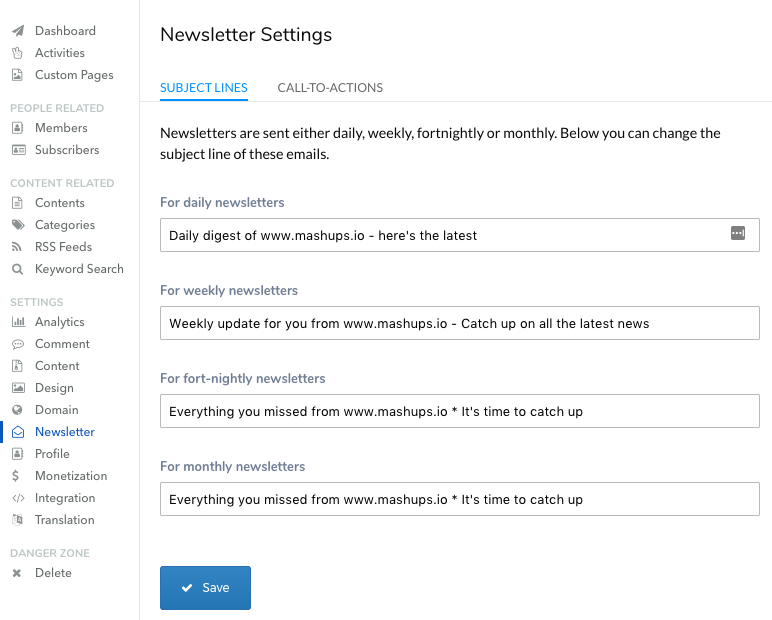 Users who signed up for newsletters, whom we call subscribers can change their newsletter details at any time and they can also un-subscribe. You can manage all your subscribers via Subscriber Management page. If a user actually becomes a member, then newsletters are automatically set and by default it's sent at a weekly interval. Just like subscribers, members can easily change their newsletter settings and opt-out completely, if they wish. You can manage all your members via Member Management page. If you go to Newsletter in the settings, you can change the subject line of the newsletter based on their frequency. You can also set up a Call-To-Action (CTA) item on your parking site to encourage your visitors to sign up for newsletter. A CTA is a visual item on website that calls for attention of the visitor. For parking sites, if you enable this, visitors will see a pop-up, prompting them to sign up for the newsletter. Since this can become rather annoying if the pop-up is displayed every time someone visits, once closed, it won't be dislayed again for about 10 days.